Places & times mentioned: Table Rock [departure 5 a.m.]; Humboldt [8 a.m.]; Verdon [10:30 a.m.]; Salem; Falls City; Rulo [ferried across Missouri at 6:30 p.m. 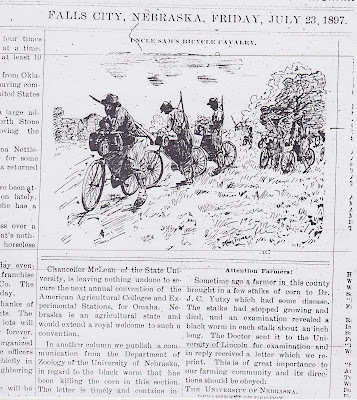 The bicycle corps of Uncle Sam’s regulars, who are riding from Missoula, Mont., to St. Louis, on bicycles camped on the old camp meeting grounds east of town last night. The corps consists of twenty colored soldiers, under command of Second Lieutenant James A Moss. Surgeon J. M. Kennedy and Edward H Boos, a reporter for the St. Louis Globe Democrat, are accompanying the corps. They arrived in town about 8:30 o’clock and rode immediately to their camping ground. The wheels were all of the same make but eight different kinds of tires and both wood and steel rims are used. All chains are enclosed in oilcloth gear cases. Extra rims were carried ready for use in case of emergency. Other parts and repairs are distributed among the men. Each wheel weighs thirty-one pounds. Including gun, cartridges, canteen, parts of tents and disjointed ten poles and all equipments, each wheel weighs seventy pounds. This weight varies with the kind of rations carried, uncooked being heavier than cooked rations. The various articles are attached to every possible part of the wheels. The object of the trip is to test the practicability of the wheel for army purposes. They make an average of fifty miles a day. Out in Montana, during a heavy storm the boys only made nine miles one day, walking through mud almost knee deep. 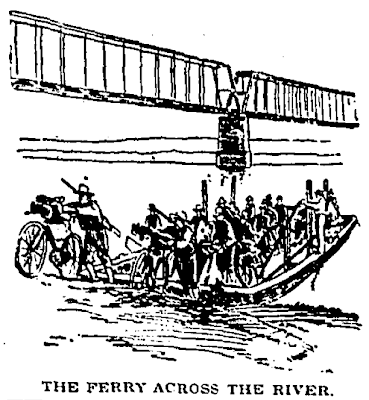 The corps left at 5 o’clock this morning and will reach Rulo today, and keep down the north bank of the river to St. Louis. 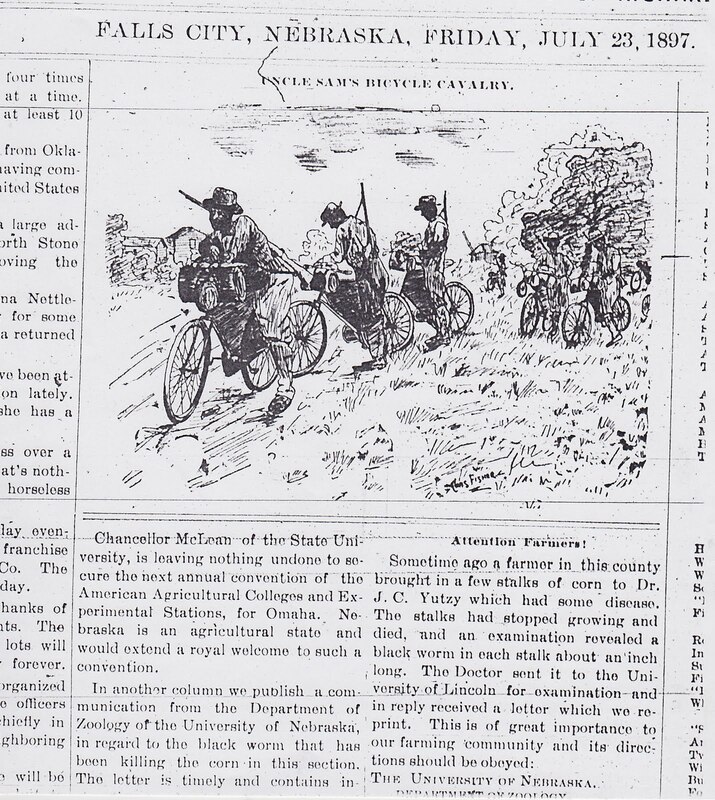 The bicycle corps of regular army soldiers arrived in Humboldt this morning about eight o’clock but went on through to Verdon their next stopping place. The corps consisted of twenty colored soldiers from several companies of infantry stationed at Ft. Missoula, Montana under command of Second Lieutenant James A. Moss, Twenty-fifth regiment. Surgeon J.M. Kennedy and Edward H. Boos, a young newspaper man, are members of the corps. Two members of the company stopped in this city at the Filson house and procured refreshments while the main body pushed on. Their presence attracted quite a crowd which spent the time while they were eating in careful examination of their wheels and a general discussion of bicycles in general. One gentleman of this city would have the crowd understand that he was a walking encyclopedia when it came to bicycles and clearly remembered when the safety [safety bicycle] was used over thirty years ago. 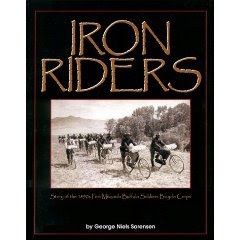 This made the ears stand out on some of the boys who were some “huckleberries” themselves on bicycles, but the tone carried conviction that the “safety” bicycle had been in use over a decade. The wheels used were all of the same make, but eight different kinds of tires and both wood and steel rims are used. All chains are enclosed in oilcloth gear cases. Extra rims were carried ready for use in case of emergency. Other parts and repairs are distributed among the men. Each wheel weighs thirty-one pounds. Including gun, cartidges, canteen, parts of tents and disjointed tent poles and all equipments, each wheel weighs seventy pounds. This weight varies with the kind of rations carried, uncooked being heavier than cooked rations. The various articles are attached to every possible part of the wheels. The soldiers are not gaudy in uniform. They wear blue cotton shirts, brown canvas trousers and leggings. Their hats are the white felt slouch of cavalrymen. Blue jackets are rolled up on the handlebars. The Corps is on the way to St. Louis. The start was made one month ago Wednesday and the destination will probably be reached July 25. So far the average distance covered each day is fifty miles. The greatest distance made in one day was seventy miles and the lowest was nine miles. The nine mile trip was made in Montana during a heavy rain in gumbo mud. The men had to walk slowly and stop every few moments to dig the mud off their wheels. In the worst of the sand hill country in Nebraska they made thirty-eight miles a day. The men have not been pushed so that its impossible to tell how far they can go in a day. Nearly all are men who have had considerable experience in wheeling. One man, however, had never ridden a wheel until two days before the start. He is now one of the best in the party. The experienced wheelmen keep up a little better, but so far the inexperienced men have kept pace with the others. The object of the trip is to test the practibility of the wheel for army service. Lieutenant Moss has had a corps in command for several months and some long trips have been made. At the fort he drills the men on their wheels. He has a drill suitable for movements on the bicycle, but the drill has not yet been made official by the war department. A part of the exercise is fence jumping. The speed with which men can ride at a fence, come to a stop and lift seventy pounds over the obstruction and then start again, is said to be equal to tests made by cavalrymen. No drills are given on the road, but exhibitions will be given every day after St. Louis is reached. The men take the railroad track in country where roads are bad. They ride in single file. Every other man carries a tent. The others carry an equal weight in blankets or other equipments. Some carry big frying pans which are made in the shape of frame satchels, two locking together, fastened in the frame of the wheel. Two men carry big camp cans in which coffee is made. The reporter carries a flag and a camera. He also rode a different make of wheel [a Sterling – MH]. Rations are sent by the war department to stations along the way and the men call for the packages. The route is mapped out in advance and once determined on is not changed because of shipment of rations. The regular rations are issued, no extras being allowed. 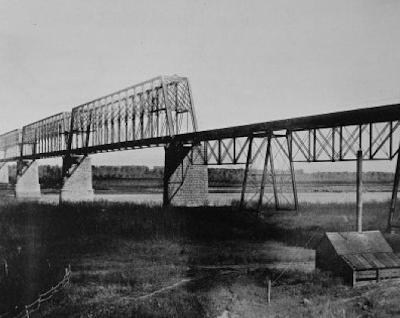 The corps will cross the Missouri river at Rulo which was their destination on leaving this city. They will follow along the north bank of the Missouri river as closely as possible until the reach St. Louis. Twenty-two colored soldiers together with the officer in command and an associated press reporter, both white men, passed through this place on bicycles last Friday. The detachment is on its way from Fort Missoula, Montana to St. Louis. 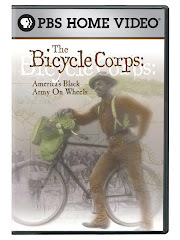 The trip was undertaken to test the bicycles for transferring soldiers from one post to another. Nearly all of them arrived here about 10:30 o’clock and rested until after eleven o’clock when they continued on their way. The rest of the men were pretty badley [sic] scattered out, the last one, who was quite sick, not arriving until evening. They have been on the road a little over a month and expect to reach St. Louis by August 1st. 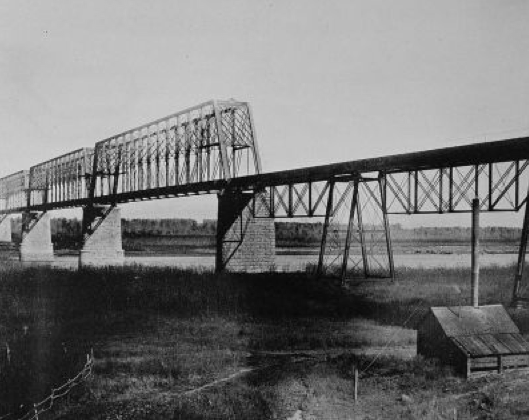 This bridge is shown in the sketch at the top of the post.